If you were to ask me to pick an exotic fruit, I would pick hands down, passion fruit, no doubt about it – It’s intriguing, alluring and captivating, even for a tropical girl like me. And the seductive aroma of the tropics gets to me, all the time. Not to mention the taste; a little sweet and partly tart, citrusy, and refreshing all at once. This sweet, tart fruit is packed with nutritional value. Here are some of the health benefits of passion fruit. This fruit is an excellent source of antioxidants such as vitamin C and beta-carotene. These antioxidants protect the cells from the effects of oxidative stress. Passion fruit is an excellent source of potassium, with 821 mg per cup, which is 23% of the recommended daily value. Potassium helps regulate sodium in the body, which in turn helps lower blood pressure. High blood pressure is a risk factor for heart attack and stroke. Passion fruit is a great source of vitamin A and beta-carotene, two antioxidants that help prevent age-related eye diseases such as macular degeneration and cataracts. With 24.5g per cup, passion fruit is an incredible source of dietary fiber, which helps reduce LDL cholesterol (bad cholesterol). According to the American Heart Association, high LDL cholesterol is a major factor for conditions like heart disease, heart attack, and stroke. The high levels of dietary fiber along with the antioxidant content make passion fruit a great food for optimal heart health. One cup of passion fruit provides 70.8mg of vitamin C, which is an impressive 118% of the recommended daily value. Vitamin C is well known as a potent immune-boosting antioxidant. Passion fruit is a good source of iron, with 3.8mg per cup, which is 21% of the recommended daily value. Foods that are high in iron are important for transporting oxygen through the blood and protecting from iron deficiency anemia. Always excited about it. 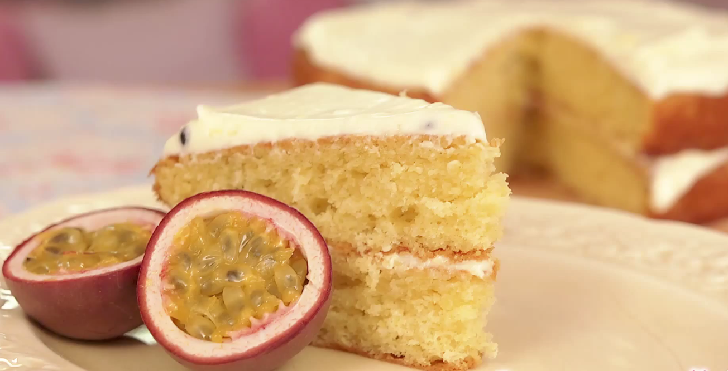 And super excited to share this easy passion fruit butter cake with glace icing with you. Hope to win you over. Strain passionfruit pulp over a small jug (you'll need ¹/₂ cup juice and 2 tablespoons passionfruit seeds). Place butter, lemon rind, sugar, eggs, passionfruit juice, milk and flour in a bowl. Using an electric mixer, beat on low speed until combined. Increase speed to high. Beat for 2 to 3 minutes or until pale. Stir in passionfruit seeds. Spread mixture into prepared pan. Bake for 50 minutes or until a skewer inserted in the centre comes out clean. Stand in pan for 10 minutes. Turn out on to a wire rack to cool. Meanwhile, make glace icing: Combine icing sugar, lemon juice and butter in a small bowl. Stir with a wooden spoon until a spreadable consistency. Spread over cake. Top with lemon rind. Serve.